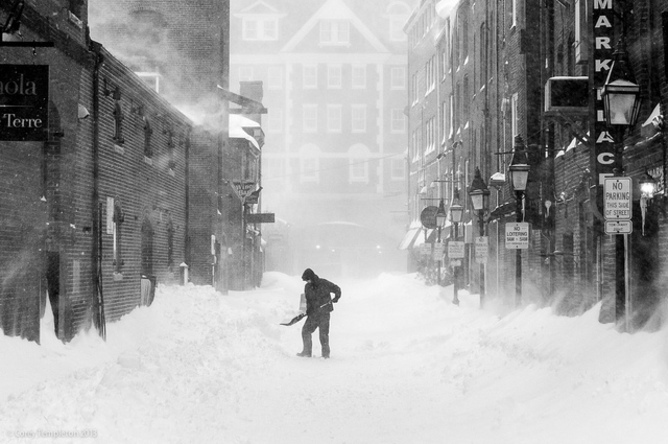 Parts of the northeastern United States are still digging out after a blizzard. And more snow is on the way. You may have seen news stories warning that shoveling snow can raise the risk of a heart attack, or heart problems, at least for some people. So, why is that? Snow shoveling is a unique form of exertion. It can be vigorous and challenging to the cardiovascular system in general, and the heart in particular. When combined with the inherent environmental conditions of winter, snow shoveling during or after a blizzard may be the “perfect storm” for a cardiac event in those with known or “occult” (hidden) coronary disease. First, a little background. The “risk-paradox” of exercise is that while physical activity performed over the long term is known to be very healthy and significantly lowers the risk for heart disease and other chronic diseases, vigorous exercise acutely increases the immediate risk of a cardiac event above that expected at rest. The risk of having a cardiac event while you are in a rested state is low, but you are more likely to have a cardiac event while performing vigorous exercise. Despite this, it is widely accepted that the benefits far outweigh the risks and should be encouraged. In fact, the more physically active you are, the less the acute risk is. Being in good shape can give you added cardio-protection. No skiing until you’ve finished your shoveling. The reason snow shoveling leads to increased risk of a cardiac event is rather simple: at rest the oxygen supply to the heart is not challenged very much, but during exercise the heart’s oxygen demands increase dramatically. Snow shoveling is particularly demanding in this regard. When you are healthy, your body has the ability to increase oxygen supply as the demand increases. As the heart beats faster and harder, the coronary vessels open up and supply the additional blood flow that is required to feed the heart’s increased demand. However, when coronary disease is present, blockages in the coronary vessels can limit blood flow, leading to slowed and inadequate oxygen supply. When the heart muscle (the myocardium) does not get sufficient oxygen, it can rapidly fail because it is highly dependent on blood flow (oxygen) to generate normal contractions. If the heart muscle becomes starved for oxygen, it also becomes vulnerable to abnormal electrical activity that can lead to dangerous arrhythmia’s (irregular heartbeats) or a heart attack. Other less common types of underlying cardiac disease, often undetected, may also make the heart vulnerable to arrhythmia’s during heavy exertion when oxygen supply is outstripped by demand and can lead to similar, catastrophic consequences. What’s under all that snow? So what is it about snow shoveling? Very few studies have examined the physiology of snow shoveling because it is technically difficult to do so. We do know that the cardiovascular demands of snow shoveling are very high. In fact it rivals the demands during maximal exercise testing, such as a cardiac stress test on a treadmill or bicycle, which often exceed 80-90% of your maximal exercise tolerance. There are two aspects of snow shoveling that make it unusual for the heart compared to, for example, walking or jogging. First and obviously, it is typically performed in cold weather. Cold air inhalation may cause a reflex constriction of blood vessels, including the coronary arteries. Cold air may also increase the blood’s propensity for clotting. If blood clots form and there is a tear in the inside of the artery, a blood clot could form a blockage. 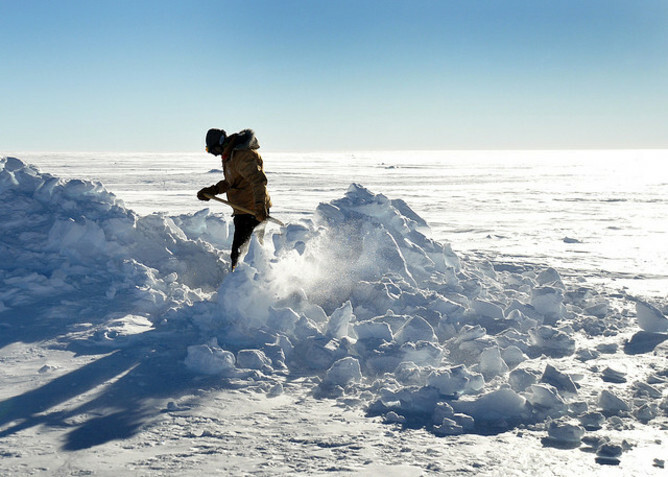 The second issue is the nature of the exercise – and snow shoveling is unique. It is typically done without a warm up, and includes considerable arm work that increases blood pressure drastically. As blood pressure rises, so too does the work of the heart. Meanwhile, your leg muscles are typically performing isometric work (where you produce a lot of tension but your muscles don’t move your joint – like an even tie during an arm-wrestle). This type of muscle activity, especially in the upper body (as you tightly grip the shovel), raises blood pressure more than, say, walking or jogging. That’s going to take a while. Each time you thrust the snow, the arms rise high, increasing blood pressure further. In addition, you typically perform the Valsalva maneuver: a natural tendency to generate lots of chest pressure without exhaling breathing out (like tennis players do when they hit a ball, or when you push hard against something). This further increases blood pressure. Ironically, the metabolic cost of snow shoveling (oxygen consumption for the whole body) may not be more than typical sub-maximal exercise like a light jog, but the oxygen cost to the heart is likely to be very high. Failing to warm up may add further demands on the heart. The blood vessels going to the working skeletal muscles may not open up as quickly, so it takes more effort for the heart to pump blood. The bottom line: the cardiac cost of snow shoveling is disproportionately high, is compounded by cold air inhalation which may increase the likelihood of blood clotting and coronary vessel constriction. The nature of the exercise is challenging to the heart and is not likely to be accompanied by an adequate warm up. I also suspect that the cool down after this exercise is likely minimal if not non-existent. Throwing off the coat and sitting in a state of exhaustion certainly doesn’t count as a proper cool down. 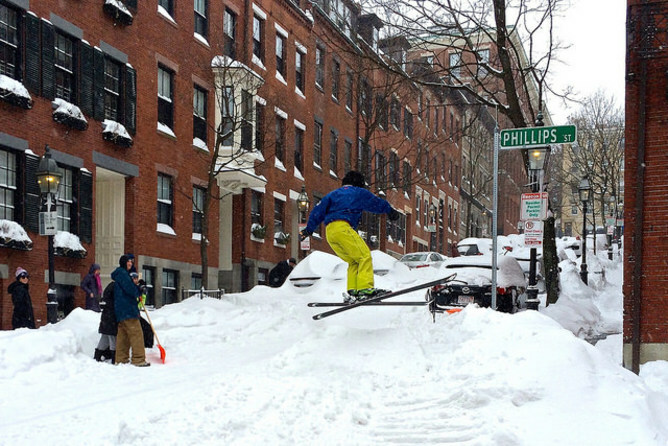 Snow will keep coming, so what can you do? 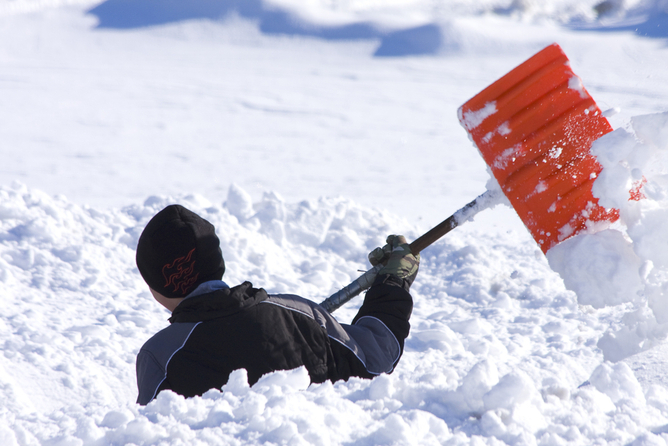 For most people, snow shoveling is a safe form of exercise, even if it is a little difficult. But you should get a green light from your doctor if you have been diagnosed with, or are considered to be at risk for, coronary heart disease. If you are not accustomed to vigorous exercise, some caution is warranted. Snow shoveling can be vigorous exercise, so start the right way. Warm up gradually – at least 5-10 minutes. Consider wearing a scarf around the mouth in very cold conditions, as this will warm inhaled air. Start with small loads of snow and keep them manageable – especially when its wet and heavy. Use a smaller shovel so that your lifts are much, much smaller and can be managed for a long time without getting exhausted. Breathe throughout the entire process of gathering, lifting and throwing the snow – don’t hold your breath as you exert effort. As you warm up, some greater effort can be considered, but easy does it. When you’ve won the battle, cool down – walk it off for a few minutes, perhaps inspecting the shoveling efforts of a few neighbors before going inside to a warm house. Winter doesn’t end (astronomically speaking, at least) until March 21. For those of us living in colder parts of the world, that means there’s likely plenty more snow still to come. Remember that being physically fit lowers your risk from cardiac disease, and regular exercise is highly recommended for most individuals. That being said, be cautious and get sound advice from your physician if in doubt. For most people, regular exercise (including both aerobic and strength) will enhance your quality of life – and make your future shoveling much easier – and safer too!